It feels like the script for yesterday’s violence in Paris was in many ways written over a week ago. Buzz Tour’s Eve, Sama and Miranda witnessed a lot of the events in Place de la Republique yesterday and we have since spoken with others in different parts of the square to hear their stories. The Place de la Republique was the planned march start location and contains a shrine of flowers, candles and messages of sorrow for the victims of the attacks. In place of the official march, Avaaz arranged for people to be able to place their shoes in the square to represent them, however the shoes then had to all be cleared away by twelve and when I arrived they were bagging up seemingly hundreds of shoes. A ‘human chain’ was formed along the march route which the police permitted as long as they remained spread out and on the pavement. We defied the protest ban and walked the march route (more on that story later) and saw a range of attitudes from those in the human chain. Some stretches were sombre and back against the wall, others happy and at the edge of the road. All sorts of banners and decorations were showing support for climate action. After the human chain dispersed, the square gradually refilled with people. Many of those who later filled the square might not have attended a legal march, but attended now to reclaim the right to protest. 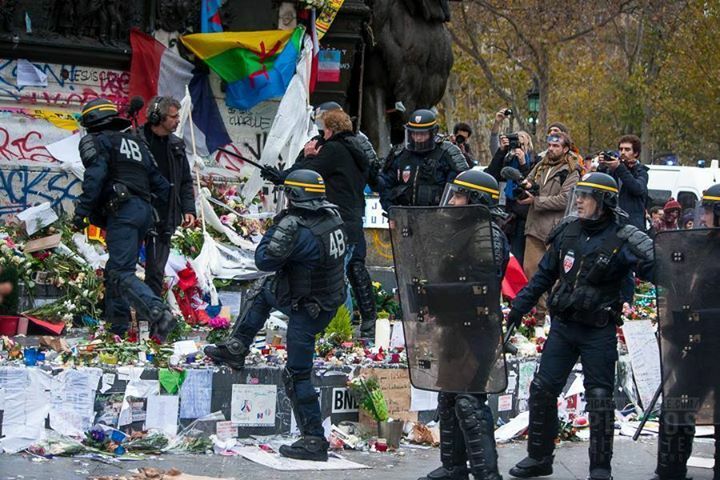 Following the Paris murders, anger seems to keep growing, feeding itself in a spiral. Speaking with French protesters there is a great deal of history of French police abusing protesters and many have become battle hardened. When a large number of angry and frustrated people gather and are confronted by a large number of police, violence is going to happen. It seems the more police, the more likely that violence will occur. Anger at capitalism as the root cause of inequality and environmental degradation has to be expressed. When unfairness builds, people are going to want to challenge and confront it and will look for opportunities to do so. To reclaim their power and respect in the face of unfairness, people seek action. People have been taken from their homes without warrant, forbidden from travel, the COP21 protest legal team are under house arrest, even we are followed and Miranda’s accommodation was raided by armed police, just to get everyone’s ID. Yesterday a few people began to throw the shoes representing the march at the police. The police tear gassed the crowd, and blocked the exits to the square. Miranda was one of the last people able to leave before the metro too was closed. Some people continued to throw things, anything that was to hand, including candles from the shrine. Police began to kettle protesters into a smaller area, sometimes slowly, sometimes with charges. In the process of kettling the crowd, the police trampled and broke many of the candles of the shrine. The police violently charged the few hundred strong crowd, including areas where nothing had been thrown from. One woman in her fifties told me, “We weren’t being violent, they kept charging us. They beat people with batons and then they would take someone and arrest them, it seemed random.” Over three hundred people were arrested, most of which are still in prison now.